If you have not heard about Amazon Prime Day you might be living under a rock. Tomorrow, Wednesday, July 15, 2015, Amazon is having what many of us like to call Black Friday in July. To give Amazon a little competition Walmart.com announced it was launching a rival sale on Wednesday including more than 2,000 online exclusive “rollbacks.” Also decreasing its free shipping minimum order to $35 from $50. In addition, Walmart.com re-launched Dare to Compare where shoppers can find top products favorite categories electronics, baby, home, patio & garden and toys at even lower prices! Only subscribers to Amazon Prime (One Year Membership) $99-per-year service will have access to Prime Day deals. If you are not a member you can sign up for a free 30-day trail of Prime in order to participate. Bear in mind that if you don’t cancel the service before the free trial period expires, Amazon will bill you for $99. Dates: Tuesday, July 14th at 12:00 AM ET to Thursday, July 16th at 11:59 PM ET. 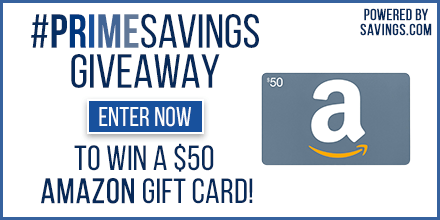 Users can enter the giveaway by heading to the Amazon page on Savings.com and submitting their email address on the form at the top of the page. The winners will be chosen via a lottery drawing and notified on Tuesday (7/21) via the email address they used to enter. I refuse to shop at Walmart.